Building and Pest Inspections from Melbourne to Geelong | Call Now! Are you thinking about making an offer on a home? Do you plan to bid at an upcoming auction? Buying a new home is very exciting; it’s easy to get caught up in the moment and then fail to see past that white picket fence and perfectly painted weatherboards. The reality is that behind the façade, your dream home may not be quite as perfect as it seems. Pests, particularly termites and white ants, can be very difficult to detect by the untrained eye – and the damage they can cause can be devastating. For complete peace of mind – and also to save potential heart ache down the track – it’s important to make sure you have a building and pest inspection carried out. Melbourne West House Inspection can take a look at the home in question and prepare a thorough report outlining any pest-related issues. Our pest and building inspections are thorough, and we leave no stone unturned. If there are termites active, we will find them. Termites are more common in weatherboard houses, however it’s also possible for them to get into the wooden frame of a brick home. Outward signs of termite damage are difficult to detect, and if they are visible then chances are they have been at work for quite some time. Signs of infestation include buckling wood, swollen floors and ceilings, visible mazes within wooden furniture or walls, and also any areas that look as though they are slightly water damaged. Externally, some termites also create visible mud tunnels around the foundations, which they use to source food. Don’t risk it. Termite damage can often be very inconspicuous, yet these creatures have the potential to cost you thousands of dollars in damage – not something you want to be dealing with six months after moving into your new home. We are authorised to carry out Pest Inspections, having completed and been certified in Certificate 111 in Pest Management, Units 8 & 10. With a thorough process and an eye for detail, we help property-buyers learn more about their potential home. For professional pest and termite inspections, contact Melbourne West House Inspection today. There are a number of reasons why a home may become infested with termites. Termites can enter a building due to the combination of the close proximity of trees and wooden fences, and built-up debris beneath the home. Leaking water and drainage concerns can also create an environment favourable to these pests, and most people don’t realise that they can enter a building through a gap as small as 2mm. If you are looking at buying a property, make sure you get it checked – especially if it is located within a termite-prone area. Most buyers are unable to carry out a proper inspection themselves, as some signs are not all that obvious to the untrained eye. 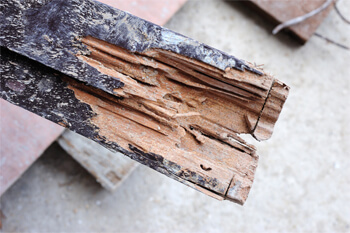 Parts of the home infested by termites are often hard to reach as well, especially without the right equipment. Don’t rely on the vendor or agent to disclose information regarding a termite infestation – most of the time, they either mightn’t tell you, or may not even know they are there. If you are looking to buy, call in the professionals. Copyright © 2017 Melbourne West House Inspection. All rights reserved.